Evil versions of the Avengers isn't exactly a new concept, but ironically evil Avengers from the Cancerverse, where everything including death is corrupted, makes it feel minty fresh. Add words by Dan Abnett and Andy Lanning to the art of penciller Miguel Angel Sepulveda and colourist Jay D Ramos, and they are down right terrifying. Cap alone is perfection. Great splash page. Glad you like the splash page guys. Who are the two characters in the middle of the page? The one on the right looks like Nightcrawler (blue skin, pointy ears, bamf-cloud dissipating around him) but we're stuck on the guy in the red uniform to his left. Is that supposed to be Adam Warlock? Kind of who he looks like to me. I guess the easiest solution would be to pick up the issue and actually read it. Man I knew hanging out here was going to be trouble. I've been off comics for going on 12 years now, but I'm getting close to climbing back on the wagon. Thanks Dan. Ha - no worries Craig - no need to thank me! 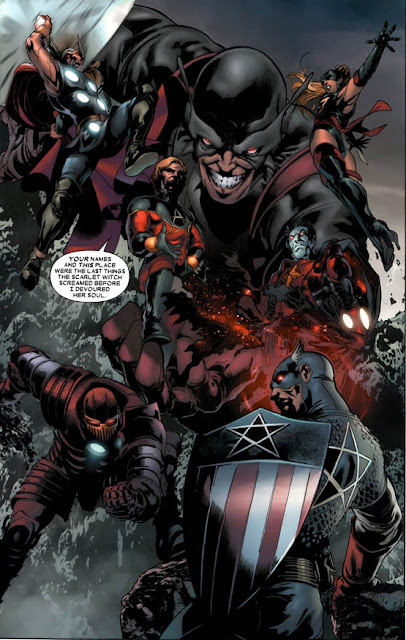 The guy under Thor's boot is Lord Mar-Vell, the big bad and the cancerverse version of the 'normal' Marvel Universe's Captain Mar-vell. Where as ours died from cancer, Lord Mar-vell was approached by sinister forces to renounce death and in doing so began transmuting other heroes to his side, starting with those gathered at his death bed. And while Nightcrawler would make an awesome Avenger, that blue faced dude is Vaughn - the cancerverse's Quasar. He's the Soundwave to Mar-vell's Megatron and an all-round nasty. Still if you are looking for a book you can pick up, not need to know allot of backstory to, and can jump off in a hand-full of issues, back into the comic freee void - Thanos Imperative is definitely the key.